HomeAnalysisJohn McCain’s Complicated Health Care Legacy: He Hated the ACA. He Also Saved It. John McCain’s Complicated Health Care Legacy: He Hated the ACA. He Also Saved It. He was not always successful. While McCain was instrumental in the passage of the Americans with Disabilities Act in 1990, most of the health initiatives he undertook failed after running afoul of traditional Republican priorities. His prescriptions often involved more government regulation and increased taxes. In 2008, as the Republican nominee for president, he ran on a health care platform that dumbfounded many in his party who worried it would raise taxes on top of overhauling the U.S. tradition of workplace insurance. Many will remember McCain as the incidental savior of the Affordable Care Act, whose late-night thumbs-down vote halted his party’s most promising effort to overturn a major Democratic achievement — the signature achievement, in fact, of the Democrat who beat him to become president. It was a vote that earned him regular — and biting — admonishments from President Donald Trump. McCain died Saturday, following a battle with brain cancer. He was 81. Coincidentally, his Senate colleague and good friend Ted Kennedy died on the same date, Aug. 25, nine years ago, succumbing to the same type of rare brain tumor. Whether indulging in conspiracy theories or wishful thinking, some have attributed McCain’s vote on the ACA in July 2017 to a change of heart shortly after his terminal cancer diagnosis. But McCain spent much of his 35 years in Congress fighting a never-ending supply of goliaths, among them health insurance companies, the tobacco industry and, in his estimation, the Affordable Care Act, a law that extended insurance coverage to millions of Americans but did not solve the system’s ballooning costs. His prey were the sort of boogeymen that made for compelling campaign ads in a career stacked with campaigns. But McCain was “always for the little guy,” said Douglas Holtz-Eakin, the chief domestic policy adviser on McCain’s 2008 presidential campaign. “John’s idea of empathy is saying to you, ‘I’ll punch the bully for you,’” he said in an interview before McCain’s death. 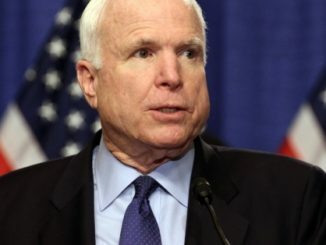 McCain’s distaste for President Barack Obama’s health care law was no secret. While he agreed that the health care system was broken, he did not think more government involvement would fix it. Like most Republicans, he campaigned in his last Senate race on a promise to repeal and replace the law with something better. After Republicans spent months bickering amongst themselves about what was better, McCain was disappointed in the option presented to senators hours before their vote: hobble the ACA and trust that a handful of lawmakers would be able to craft an alternative behind closed doors, despite failing to accomplish that very thing after years of trying. What bothered McCain more, though, was his party’s strategy to pass their so-called skinny repeal measure, skipping committee consideration and delivering it straight to the floor. They also rejected any input from the opposing party, a tactic for which he had slammed Democrats when the ACA passed in 2010 without a single GOP vote. He lamented that Republican leaders had cast aside compromise-nurturing Senate procedures in pursuit of political victory. In his 2018 memoirs, “The Restless Wave,” McCain said even Obama called to express gratitude for McCain’s vote against the Republican repeal bill. Better known for his work on campaign finance reform and the military, McCain did have a hand in one landmark health bill — the Americans with Disabilities Act of 1990, the country’s first comprehensive civil rights law that addressed the needs of those with disabilities. An early co-sponsor of the legislation, he championed the rights of the disabled, speaking of the service members and civilians he met in his travels who had become disabled during military conflict. McCain himself had limited use of his arms due to injuries inflicted while he was a prisoner of war in Vietnam, though he was quicker to talk about the troubles of others than his own when advocating policy. Yet two of his biggest bills on health care ended in defeat. In 1998, McCain introduced a sweeping bill that would regulate the tobacco industry and increase taxes on cigarettes, hoping to discourage teenagers from smoking and raise money for research and related health care costs. It faltered under opposition from his fellow Republicans. 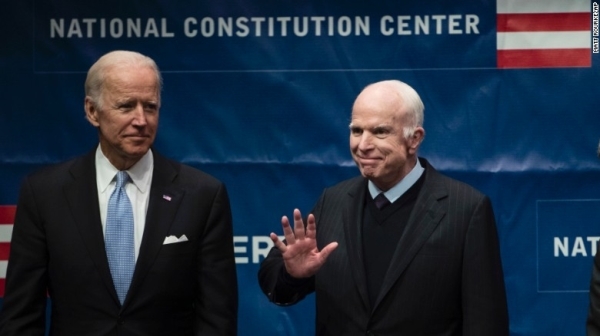 McCain also joined an effort with two Democratic senators, Kennedy of Massachusetts and John Edwards of North Carolina, to pass a patients’ bill of rights in 2001. He resisted at first, concerned in particular about the right it gave patients to sue health care companies, said Sonya Elling, who served as a health care aide in McCain’s office for about a decade. But he came around. The legislation would have granted patients with private insurance the right to emergency and specialist care in addition to the right to seek redress for being wrongly denied care. But President George W. Bush threatened to veto the measure, claiming it would fuel frivolous lawsuits. The bill failed. McCain’s health care efforts bolstered his reputation as a lawmaker willing to work across the aisle. Sen. Chuck Schumer of New York, now the Senate’s Democratic leader, sought his help on legislation in 2001 to expand access to generic drugs. In 2015, McCain led a bipartisan coalition to pass a law that would strengthen mental health and suicide prevention programs for veterans, among other veterans’ care measures he undertook. It was McCain’s relationship with Kennedy that stood out, inspiring eerie comparisons when McCain was diagnosed last year with glioblastoma — a form of brain cancer — shortly before his vote saved the Affordable Care Act. That same aggressive brain cancer killed Kennedy in 2009, months before the passage of the law that helped realize his work to secure better access for Americans to health care. “I had strenuously opposed it, but I was very sorry that Ted had not lived to see his long crusade come to a successful end,” McCain wrote in his 2018 book. While some of his biggest health care measures failed, the experiences helped burnish McCain’s résumé for his 2000 and 2008 presidential campaigns. In 2007, trailing other favored Republicans, such as former New York City mayor Rudy Giuliani in early polling and fundraising, McCain asked his advisers to craft a health care proposal, said Holtz-Eakin. It was an unusual move for a Republican presidential primary. The result was a remarkable plan that would eliminate the tax break employers get for providing health benefits to workers, known as the employer exclusion, and replace it with refundable tax credits to help people — not just those working in firms that supplied coverage — buy insurance individually. He argued employer-provided plans were driving up costs, as well as keeping salaries lower. The plan was controversial, triggering “a total freakout” when McCain gained more prominence and scrutiny, Holtz-Eakin said. But McCain stood by it.